The Borough of Chambersburg is a full service municipality organized under the Pennsylvania Borough Code to serve the citizens and businesses of Chambersburg. The Borough maintains a staff of around 300 full time, part time, and seasonal employees to serve the community. Most borough operations are conducted through offices located at 100 South Second Street, Chambersburg's historic City Hall. Although, the Borough operates facilities throughout the community as well as in surrounding townships. The staff is dedicated to serving your needs. 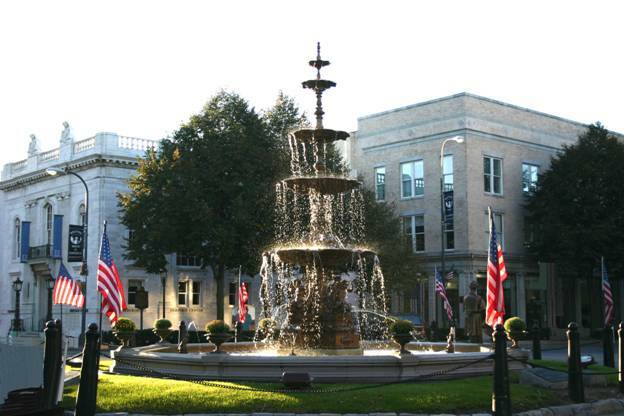 As a full service municipality, Chambersburg supplies a wide variety of services; more services than any other municipality in the Commonwealth. In addition to typical municipal services such as highway (58 miles of streets), storm sewer system, planning, zoning, and code enforcement, Chambersburg operates our own Police force, a combination paid and volunteer Fire Department, a Basic Life Support EMS service, a recreation department with acres of parkland, rail trail and pool, municipal parking program, residential rental inspection program, community and economic development including a Main Street downtown revitalization effort and an Elm Street neighborhood preservation program, and four utilities. Chambersburg is the only municipality in Pennsylvania to operate an Electric Utility, a Natural Gas Utility, a Water Utility, a Sanitary Sewer Utility, and a residential/commercial solid waste Trash program. We are one of only 35 municipal electricity communities in Pennsylvania and the largest of the group in terms of customers. We are one of only true municipal natural gas utilities. Chambersburg utilities represent the preponderance of municipal employees, facilities, and issues. Situated as the County Seat of Franklin County, Chambersburg is a large and diverse community. Sometimes dealing with city issues, Chambersburg borough still maintains a small-town quality of life. According the PA Department of Community and Economic Development, boroughs are the second most common form of municipal government in Pennsylvania, their number exceeded only by the number of second class townships. The 962 boroughs represent 37.5% of all general-purpose municipal governments in Pennsylvania. There is an average of 15 boroughs per county. Chambersburg is one of the largest boroughs by population and by the size of our operating budget. The largest boroughs in population are State College - 38,923, Bethel Park - 33,823, Norristown- 30,749, Monroeville - 29,169 and Plum - 25,609. Sixteen boroughs have populations under 100. The smallest are S.N.P.J. (Lawrence County) - 12; New Morgan (Berks) - 16; Valley-Hi (Fulton) - 19; Green Hills (Washington) - 21; and Seven Springs (Somerset) - 22. Chambersburg's population: 20,691 (2016). Chambersburg operates under the Council-Manager form of government. The Chief Administrative Officer of the organization is the Borough Manager, appointed by and serving at the pleasure of a majority of the Town Council. The Council, currently ten members, is elected by Wards for four year terms. The Council elects one of their own to serve as Council President, Council Vice-President, and Chairman and Vice-Chairman of the Finance Committee. The Council serves as the legislative and quasi-judicial branches of local government. Their mission is to preserve the fiscal security of the Borough and set long term objectives and goals for staff. They also engage in all manner of community planning. The Mayor is independently elected. Pursuant to the Pennsylvania Borough Code, the Mayor is the supervisor of the Borough Police Department, joins Council meetings as a non-voting member, and may approve local laws adopted by Council. The Mayor also serves as a dignitary representing the community. Chambersburg, the county seat of Franklin County, is the historic and commercial center of the region characterized by varied small and medium industrial enterprises. It is a rich agricultural and residential area. It was settled by Benjamin Chambers, who in 1730 with his brother crossed the Susquehanna River and headed southwestward to his final destination at the confluence of the Conococheaque Creek and the Falling Spring. This location provided him with the water power necessary for a gristmill and a sawmill which operated there for many years. The Community was formally laid out in 1764 by the then Colonel Chambers extending south and east from the fort that had been built for protection against Indian raids. Chambersburg grew in importance as a crossroad where the travel east to west toward the frontier crossed the travel north and south within the great valley. The municipal government was established through a state granted charter as a borough in 1803. During the Civil War, Chambersburg played a significant role in the Shenandoah and Cumberland Valley theater of operation. It was occupied three times by Confederate Forces. In the center of town, at the diamond which is now referred to as Memorial Square, General Robert E. Lee, after consulting with his associates, made the fateful decision to move east resulting in the Battle of Gettysburg which was the turning point of the war. Finally, on July 30, 1864, Confederate troops under General J.A. McCausland of the General Jubal Early Army burned down the center of the town when ransom was not paid for alleged outrages committed by Union Troops in the Shenandoah Valley. Since then the Borough was rebuilt and has grown.